healthy soul food: tuna cakes. please don’t judge this blog post by its title. all tuna cakes are NOT created equal!!! these tuna cakes are sooooo incredible. trust me. actually, don’t trust me ~ just make them and taste for yourself. tuna is so good for you. as you know already. rich in omega 3’s, right? low in fat? i don’t know. i just love the stuff, and it’s really cheap! 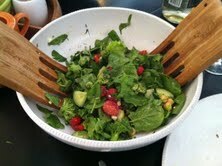 the hub and i just had two tuna cakes each, along with this fresh salad, and only one tuna can was harmed in the making. the tuna cakes were scarfed up before i could even think about getting a picture. you gotta have this salad dressing as well. i’ll post that in the next blog. okay, i also added some pancetta that i crisped up, just because i had it. but honestly, i didn’t even taste it. keep it simple. the thing that makes these so amazing is the tabasco, and the crust. make your tuna cakes into patties and dredge in CORN MEAL. oh yes. this will make your tuna cakes taste like you’ve been to a fish fry, minus all those calories and oil splattered all over your kitchen. AMAZING. fry your tuna cakes in a little olive oil. it’ll take a while to get that corn meal browned. i can’t imagine how many ways you can make these cakes. maybe some day i’ll try a bunch of variations and post them on here, but i’m too in love with the tabasco flavor mixed with the corn meal. Previous Previous post: the julia child dinner party.